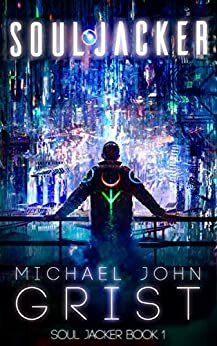 "MJG proves that cyberpunk is alive and kicking." - Michael Marshall Smith, bestselling author of 'Only Forward'. "Superb - a Fantastic Voyage into the soul." - Pat Mills, creator of 2000AD featuring Judge Dredd. Then a terrified girl bolts into his jack-site, seeking a unique brain-hack to escape Don Zachary, the vicious slumlord. Ritry's no hero, but he won't stand by while another innocent dies. If you love Neuromancer, Altered Carbon or Snow Crash you'll love this book. Get it today to plunge into Ritry's battle for all Souls. Available as kindle ebook and paperback. Previously published as Mr. Ruin. 5.0 out of 5 starsA must read for all sci-fi and cyberpunk fans! Two stories intricately weaved together and converging for a glorious ending. A post apocalyptic world described in amazing detail and clarity and a story that keeps your heart racing for more - brilliant! I loved Soul Jacker book 1 and am looking forward to reading more in the series. I was hooked from the first pages and had serious trouble putting it down. I really liked this book. The story was engaging, the characters interesting, and the plot twisted and turned enough that I didn't know what was happening until the end. I'm really interested to learn what's next in the series. This is a great book, but this review must come with a warning though. This book is hard to put down. It's got a compelling story with interesting characters and story lines. Highly recommended. This is my first in this genre. I've never been able to get into cyberpunk before but this was a very good read. Enjoyed it!